While there are some people who will argue that seniors have no need for life insurance, the truth is that there are numerous reasons why someone who is in their 50s, 60s, and over should have this type of financial protection. First, most everyone will have some amount of final expenses. Today, the average cost of a funeral in the United States runs at about $10,000 - especially when you factor in the expense of related items such as a burial plot, headstone, and flowers. In addition, it may be that pension plans will stop paying out following the death of one individual. If this person is married, it could leave their spouse or partner without an income in retirement - a time when they need that income the most. Having a life insurance policy could provide the other person with the ability to continue receiving incoming funds throughout the remainder of their retirement years. Life insurance for seniors has many other purposes, too. For instance, it may be purchased for paying off estate taxes, funding high college education costs for a grandchild, or even donating to one's favorite charity in an amount that is much larger than could have been done during life. When applying for coverage as a senior, though, there is a concern about qualification. Because of advancing age - as well as potential adverse health issues - it may be more difficult for someone who is a senior to qualify, especially for traditionally underwritten coverage. The good news is that, even if you have been turned down for life insurance in the past, there are still options available for obtaining the policy that you need. That is in the form of no exam life insurance. No exam life insurance is life insurance coverage that, as its name implies, does not require that the applicant undergo a medical examination during the underwriting process. With this type of coverage, there is oftentimes only an application for coverage to complete. A no exam option could be an ideal choice for a senior who may have adverse health issues as he or she will not need to worry about having to submit a blood and urine sample. Nor, in most cases, will they be required to answer a myriad of in-depth medical questions. Because there are no medical requirements to contend with, these policies can typically be approved much more quickly that traditionally underwritten life insurance coverage, too - meaning that a senior can obtain their policy within just a few days as versus several weeks, or longer, if they had opted to go with a regular policy. It is important to note, however, that because the applicants who purchase no exam life insurance are often considered to be a higher risk to the insurance company due to their age and / or health, the premium that is charged for this coverage is usually higher than the cost of a comparable plan that has medical underwriting. 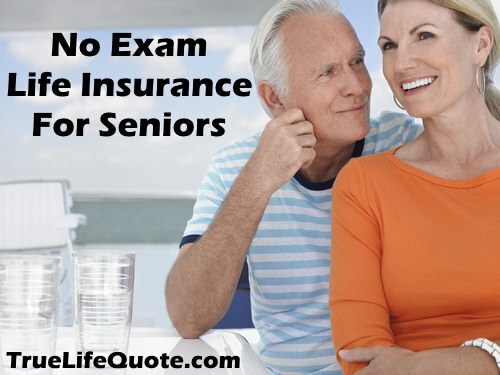 However, a no exam life insurance policy for a senior could provide the best option that is available for ensuring that his or her spouse or other loved ones are covered with the financial protection that they need when the time arrives. What Types of No Exam Life Insurance Are Available for Seniors? A senior can typically purchase either term or permanent coverage on a no exam life insurance policy - depending on the insurance carrier that they choose to go with. In this case, the policies will operate in much the same manner as regular life insurance policies do, with face amounts of up to several thousand dollars in coverage. For example, a no exam term life insurance policy for seniors will provide death benefit protection only, without any type of cash value or investment value build up. A senior can usually choose a certain time frame, or "term," on their term life policy. These are oftentimes for five years, ten years, 15 years, or 20 years. In some cases, a 30 years term life plan may also be offered, depending on the age and health condition of the individual who is applying for the coverage. A permanent no exam life insurance policy for a senior will offer both a death benefit, as well as a cash value component. With permanent coverage, there is no time limit, as these policies are meant to last throughout a person's lifetime. Once a senior owns a permanent policy, the coverage cannot be cancelled by the insurance company, other than for the non-payment of premium - and, the premium amount is typically locked in and cannot be increased. For a senior, a permanent policy offers a nice way to ensure that the premium that is charged will not go up. So, for those who are living on a fixed income or budget, this can be extremely helpful. The cash value provides the senior with a way to save money on a tax-deferred basis. This means that the gain in the cash fund will not be taxed until the time it is withdrawn. The funds can be borrowed or withdrawn for any reason, such as retirement income supplement, paying off debts, or just supplementing expenses. Any amount of unpaid loan balance, however, will go against the amount of the death benefit that is paid out at the senior's passing. When purchasing a no exam life insurance policy, seniors should be sure to understand how the death benefit pays out. This is because, in some cases, the named beneficiary may not be able to receive the full amount of the death benefit that is stated on the policy. For example, In order to protect itself from the additional risk it is taking on, the insurance company that is offering a no exam life insurance policy for seniors may have graded death benefits on the coverage. This means, for instance, that if the insured were to die within just the first two years of owning the coverage, the beneficiary might only receive as a benefit a return of the premiums that have been paid in. They may also possibly be able to receive a small additional amount of interest. If, however, the senior insured dies after owning the policy for longer than two years, and then the beneficiary would be able to receive the full amount of the death benefit that is stated in the policy. With this in mind, it is essential for a senior who is considering a no exam life insurance policy to understand all of the benefits that are being offered on the plan, as well as how everything works. When shopping for life insurance for seniors, it is typically best to go with a company or an agency that has access to more than just one life insurance carrier. This is because - even though there are no medical underwriting requirements on these policies - the premiums that are charged can still vary a great deal, even for the same type and amount of protection. Therefore, shopping for a no medical exam life insurance policy should be considered similar to seeking any other important item - shop and compare the very best policy and price for you and your specific needs. If you are ready to start searching, we can help. We work with many of the top life insurance companies in the marketplace today, and we can assist you with obtaining all of the important information that you will require in order to make a purchase decision. We can do so for you quickly and easily - and without you having to meet with a life insurance agent in person. When you are ready to begin, fill out the form on this page to receive your initial insurance quotes. We can also be reached by phone in order to discuss any additional questions or concerns that you may have regarding the purchase of no exam life insurance for seniors - or even just about life insurance in general. Please feel free to contact us directly. You can find us by dialing, toll-free, 877-235-9299. We understand that there are a lot of variables to keep in mind when it comes to purchasing life insurance as a senior. You want to ensure that you are obtaining the right amount of protection and that you're getting the coverage for the right premium price. But the good news is that you now have an ally on your side. So, contact us today - we're here to help.